Are they safe for eating? Melamine dishes are mostly chemically based plastic tableware. They were popular when introduced during the 1950's and 1960's, but when Corelle arrived on the scene in the early 1970's, Melamine faded into the background. While Corelle is still highly desired today because of its thin design and delicate porcelain look and feel, Melamine has once again regained its earlier popularity and has taken the general mercantile by storm. It's the abundance and variety of colors and patterns, as well as the affordability of these plastic dishes make them an appealing option. Melamine does pose a health risk and though it can be minute and considered acceptable, it can worsen if the dishes are not used safely. According to the U.S. Food and Drug Administration (FDA), a substance called melamine-formaldehyde resin is used in the manufacture of melamine dishes, as well as some other plastic containers. 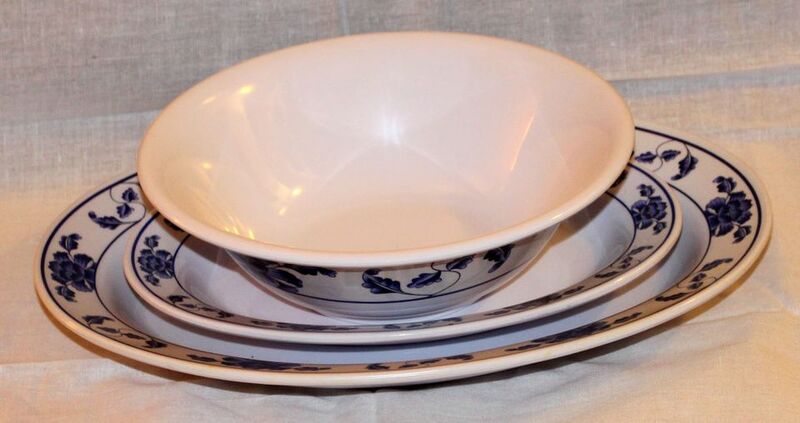 According to the FDA, safety tests were conducted by The Taiwan Consumers' Foundation of tableware made in China, and results showed that during the manufacturing process, a small residue of the melamine compound could remain in the dish and under certain conditions, could migrate slowly to foods that come into contact with it. The FDA has conducted its own safety and risk assessment and concluded that the tableware does not pose a health risk, but they do recommend care when using it. Is Melamine Worth the Risk? The FDA has concluded from its own assessment that the safety risk is low and within acceptable levels, but they do caution the use of melamine dishes. There appears to be more risk when it comes to infants and children, who are more susceptible than adults to even the most minute chemical residue. Do not use melamine tableware for infants or children. Never heat food or drinks in melamine (the risk is higher when heated). Never use melamine in the microwave, unless it is clearly marked 'microwave safe'. Acidic foods also increase the risk, especially when heated. Using melamine dinnerware to serve cold drinks and finger foods that have been heated on something else are considered well within safety guidelines. Trays to carry serving items and cold snacks should pose no significant threat. Keep in mind that safety standards do vary considerably by country and these types of dishes are usually imported. What is deemed 'microwavable' in one country may not be in another.